GREATER COLUMBUS is a thriving metropolitan area of 1.6 million people at the heart of the largest concentration of population and economic activity in North America. Already the third fastest growing major metropolitan area in the Midwest, the entire community is seizing new opportunities to propel Greater Columbus into the ranks of the nation's most innovative, attractive and business-friendly communities. Columbus as a city, has a colorful history and not without its ups and downs. It was created specifically to be the capital of Ohio and remains the center of state government. Its diverse population has created an ideal representative city for the entire country which makes Columbus prized as a test market for new enterprise, products, and services. It once had an image problem and was often referred to as a cow town dating back to the early days when the area now known as the Arena District was most cattle pens brought here not only for meat processing, but leather processing. Columbus was the Buggy Capital of the world which required large quantities of leather used in the manufacture of buggies. The old image of the town has changed drastically over the last several decades. Distinct neighborhoods have been restored to their original character and taken on individual personalities never imagined by their original inhabitants. The best way to see German Village is to park the car, and walk. Each house is unique and there's a great mix of obviously restored houses. As you walk through the neighborhood, you'll see many reminders of the Village's rich German history. 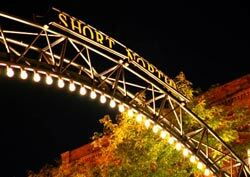 Short North is a wonderful eclectic mix of art galleries, boutiques, restaurants with condominiums and apartments! The Short North is a historic, urban neighborhood which some consider to be the Art District of Columbus and the first Saturday of each month features an event called the Gallery Hop. 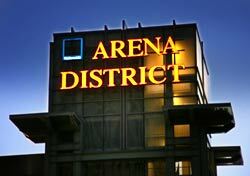 Arena District is the premier downtown entertainment district and one of the hottest urban residential areas in the state. With its exceptional dining, accessible parking, live entertainment and affordable hotels, families, couples and singles alike, can enjoy the district and all that it has to offer. Columbus is also known for its beautiful and unique gardens. One of the most unique is Topiary Garden located downtown. It is the only topiary garden designed to represent a famous painting. The Park of Roses in Clintonville, has one of the country's largest rose collections. Franklin Park is also a major attraction. The stunning architecture of the conservatory was recently enhanced with the installation of a computer controlled LED lighting program that brings visitors from around the world. The concept came from artist James T. Mason who teaches sculpture at the Cultural Arts Center in Columbus. He designed, created and installed the metal frames as well as the living topiaries. Once the metal sculptures were installed, the plants were then carefully trained and sculpted to grow around the metal supports. Elaine Mason was the initial topiarist and she trained city gardeners to trim the figures to conform to Georges Seurat's famous painting A Sunday Afternoon on the Isle of La Grand Jatte. Built in 1895 the Franklin Park Conservatory is on the National Register of Historic Places. 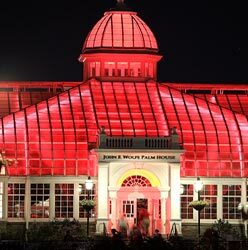 Today, it is a premier horticultural and educational institution showcasing exotic plant collections, special exhibitions, the spectacular Chihuly artworks of glass, and the James Turrell permanent lighting exhibit of the John F. Wolfe Palm House. The Ohio State University is one, if not the largest, universities in the country. Its football program draws national attention almost every year, but even more widely known is the university's educational facilities and its graduates who have become embassadors at large for the university. The Ohio State University has long been associated with Columbus, but there are also a number of other universities and colleges located in Central Ohio. Columbus has always been a college town of sorts and that's one of the reasons Columbus seems like a small hometown. 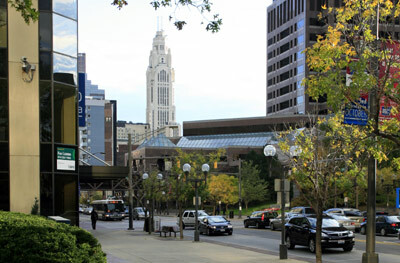 Today Columbus is home to The Ohio State University, Capital University, Franklin University, Columbus College of Art and Design, and Columbus State Community College.